Do you remember this post about my great-great uncle? 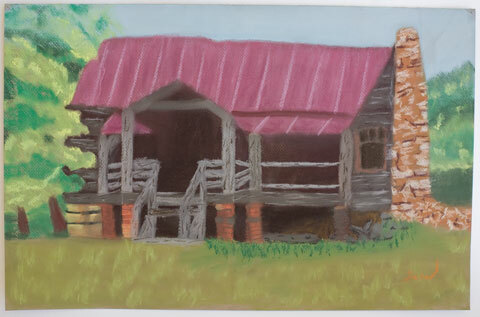 Well, I went back through some photos I’d taken of his cabin right after he died and found one to paint. At first I couldn’t decide if I would paint it or if Squirt would In the end my Squirt painted an oil pastel of it. We gave it to my mom for Mother’s Day. He’s already told her she has to get it framed and he has to borrow it back next year to enter in our local art show. I think this is one of the best ones he’s ever done. Wow! This is awesome and what a great gift!